Englishman Steve Holcombe put his signature on the 3rd Round of the Maxxis Italian Enduro Championship with a really incredible race. After a cautious start, Steve recovered a 15-second gap ahead of Alex Salvini on the first lap, Battling throughout the day to create an exciting race with Holcombe 6 seconds ahead of Salvini extending his lead in the Championship. Photo Giovanni Chillemi. The weekend opened on Friday 29 with the press conference to present the competition and inauguration of the photographic exhibition dedicated to the 90th anniversary of the Motoclub Sanremo. The ceremony took place at Villa Boselli with the presence of the mayor of Taggia Mario Conio, the municipal councilors Espedito Longobardi and Raffaello Bastiani, the regional tourism councilor Gianni Berrino, the Co.Re. Liguria Giulio Romei and of course the president of the motoclub Sanremo Danilo Benza who told and illustrated the history and successes of the Ligurian club. Many drivers and experts in the room, including the ISDE 2018 champions Andrea Verona, Davide Soreca and Matteo Cavallo. Following this, again at Villa Boselli, a meeting was held between the IMF, the Arma dei Carabinieri Forestali and the local motorcycle clubs with the theme “Enduro / Territorio: a clear rule that means right and duty. Can a coexistence and a sharing of the territory exist? ". Important points have been touched, with respect for the territory and the rules as a key point. Saturday, March 30, the usual preliminary operations were carried out, which colored the small port of Arma di Taggia, the heart of the event; 190 motorcycles that entered the scenic closed park and that today, Sunday 31 March, gave birth to the third round of the Italian Absolutes-IMF Cup / Maxxis Italian Cup of Enduro. However, before seeing the pilots in action, many fans took part in the usual 24MX Autograph Session with the national and international Enduro big names who signed posters and took selfies with their admired. The name of the winner of the first 24MX Contest was then extracted to win Andrea Verona's autographed race shirt; the lucky winner was Giacomo Rossi of Perugia! After the briefing the whole Enduro circus took the stage to award a photo to show its closeness to the young Manolo Morettini in this difficult moment after the recent loss of the mother. When the sun went down and set the alarm with the new time, it was time to concentrate on the race. Started this morning at 8.30 am, the third round of the Italian Absolutes-IMF Cup / Enduro Maxxis Italian Cup saw the drivers taking part in three very different special tests; the Airoh Cross Test was characterized by sand with 2500 meters of track drawn on the beach of Arma di Taggia, while the Enduro Test and the Extreme Test X-CUP Motocross Marketing - Galfer was developed on a mainly rocky ground. In total the riders faced 4 laps (3 for the Italian Cup) with the Airoh Cross Test repeated for a fifth time before returning to the paddock. 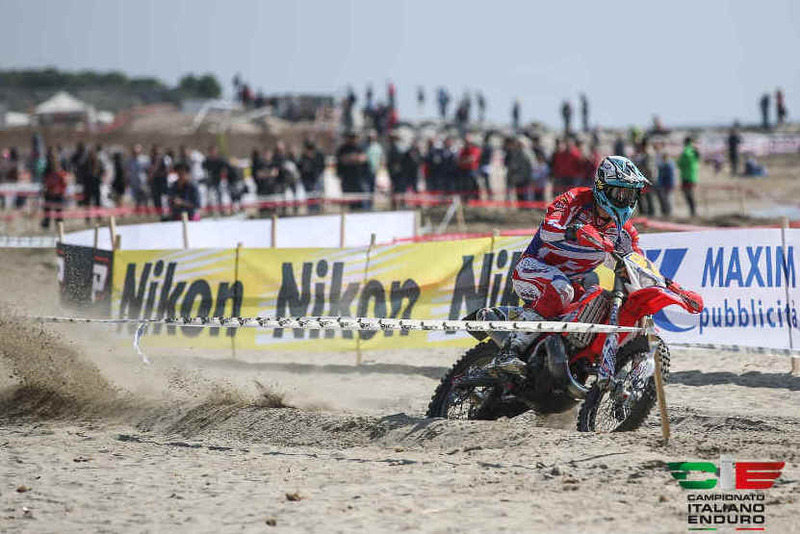 Eyes also on individual trophies; Daniel McCanney dominated the sand at the Airoh Cross Test, while Steve Holcombe was among the rocks of the Extreme Test X-CUP Motocross Marketing. Among the very young in the Enduro Action Trophy, best time for Andrea Verona, unleashed in this second act of the Absolutes of Italy Maxxis of Enduro. The Italian Absolute Cup-IMF / Italian Cup will return in two weeks, exactly April 14, to Pontremoli (MS) with the fourth round. Do not miss the evening prologue, Saturday 13 April from 6.00 pm!